What do the pyramids in Egypt, Leonardo do Vinci's portrait of the Mona Lisa, sunflowers, the snail, the pine cone and your fingers all have in common? The answer to this question lies hidden in a sequence of numbers discovered by the Italian mathematician Fibonacci. The characteristic of these numbers, known as the Fibonacci numbers, is that each one consists of the sum of the two numbers before it. 0, 1, 1, 2, 3, 5, 8, 13, 21, 34, 55, 89, 144, 233, 377, 610, 987, 1597, 2584 ..
Fibonacci numbers have an interesting property. When you divide one number in the sequence by the number before it, you obtain numbers very close to one another. In fact, this number is fixed after the 13th in the series. This number is known as the "golden ratio." When conducting their researches or setting out their products, artists, scientists and designers take the human body, the proportions of which are set out according to the golden ratio, as their measure. Leonardo da Vinci and Le Corbusier took the human body, proportioned according to the golden ratio, as their measure when producing their designs. The human body, proportioned according to the golden ratio, is taken as the basis also in the Neufert, one of the most important reference books of modern-day architects. There are several golden ratios in the "ideal human face" determined by scientists and artists. Distance between pupils / distance between eyebrows. In a study carried out between 1985 and 1987, the American physicist B. J. West and Dr. A. L. Goldberger revealed the existence of the golden ratio in the structure of the lung. One feature of the network of the bronchi that constitutes the lung is that it is asymmetric. For example, the windpipe divides into two main bronchi, one long (the left) and the other short (the right). This asymmetrical division continues into the subsequent subdivisions of the bronchi. It was determined that in all these divisions the proportion of the short bronchus to the long was always 1/1.618. A rectangle the proportion of whose sides is equal to the golden ratio is known as a "golden rectangle." A rectangle whose sides are 1.618 and 1 units long is a golden rectangle. Let us assume a square drawn along the length of the short side of this rectangle and draw a quarter circle between two corners of the square. Then, let us draw a square and a quarter circle on the remaining side and do this for all the remaining rectangles in the main rectangle. When you do this you will end up with a spiral. The spirals based on the golden ratio contain the most incomparable designs you can find in nature. The first examples we can give of this are the spiral sequences on the sunflower and the pine cone. 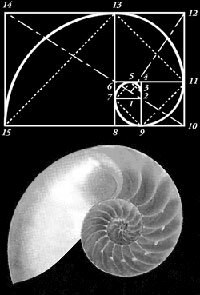 The flawless design in the nautilus shell contains the golden ratio. The molecule in which all the physical features of living things are stored, too, has been created in a form based on the golden ratio. The DNA molecule, the very program of life, is based on the golden ratio. DNA consists of two intertwined perpendicular helixes. The length of the curve in each of these helixes is 34 angstroms and the width 21 angstroms. (1 angstrom is one hundred millionth of a centimetre.) 21 and 34 are two consecutive Fibonacci numbers. The golden ratio also manifests itself in crystal structures. Most of these are in structures too minute to be seen with the naked eye. Yet you can see the golden ratio in snow flakes. The various long and short variations and protrusions that comprise the snow flake all yield the golden ratio. In the universe there are many spiral galaxies containing the golden ratio in their structures. There are other examples of golden ration in nature. The fact that a great many unconnected animate or inanimate structures in nature are shaped according to a specific mathematical formula is one of the clearest proofs that these have been specially designed. The golden ratio is an aesthetic rule well known and applied by artists. Works of art based on that ratio represent aesthetic perfection. Plants, galaxies, micro-organisms, crystals and living things designed according to this rule imitated by artists are all examples of Allah(God)'s superior artistry. Allah(God) reveals in the Quran that He has created all things with a measure.